The OOO Aquatron-BKhKсompany offers quality waterproofing materials at affordable prices. Our mixtures are based on patented components that will provide effective protection of a basement from water and moisture, as well as increase the service life of the entire installation. Waterproofing is one of the most important stages of construction when installing a basement. The reason for this is the destructive effect of ground water and internal sources of moisture, which are almost constantly acting on the construction elements. As a result, the useful life of a building can be shortened. Waterproofing an installation from within is directed first and foremost at protecting against such sources of water as water mains and drainage lines. For best results, we recommend using the materials of the Aquatron series. They are noted for modest cost, they demand minimal expenditures for preparatory operations, and they combine a large number of useful properties. simplicity of application, not requiring special skills. Waterproofing a basement using the penetrating and armoring materials of Aquatron‑6 and Aquatron‑8 are the best way to avoid leaks both from the outside and from the inside. Using our product will make it possible to get rid of the appearance of water on the site without heating the foundation or other expensive and labor-intensive operations. All seams between adjacent structural elements must first be stitched. The size of the groove should be not less than 20 × 20 mm. The locations of active leaks should be noted and scraped. Then the seams and locations of leaks should be flushed and cleaned of dirt. The locations of leaks should be filled with the Aquatron‑8 compound, and the grooves filled with the waterproofing mixture Aquatron‑6. The surfaces of walls and foundations should be prepared. This is done by carefully washing the surfaces and cleaning them of oily spots, concrete film, and other contaminants that would interfere with the penetration of the mixture into the elements of the basement structure, as well as moistening them well. Apply the Aquatron‑6 compound using a spatula or brush. 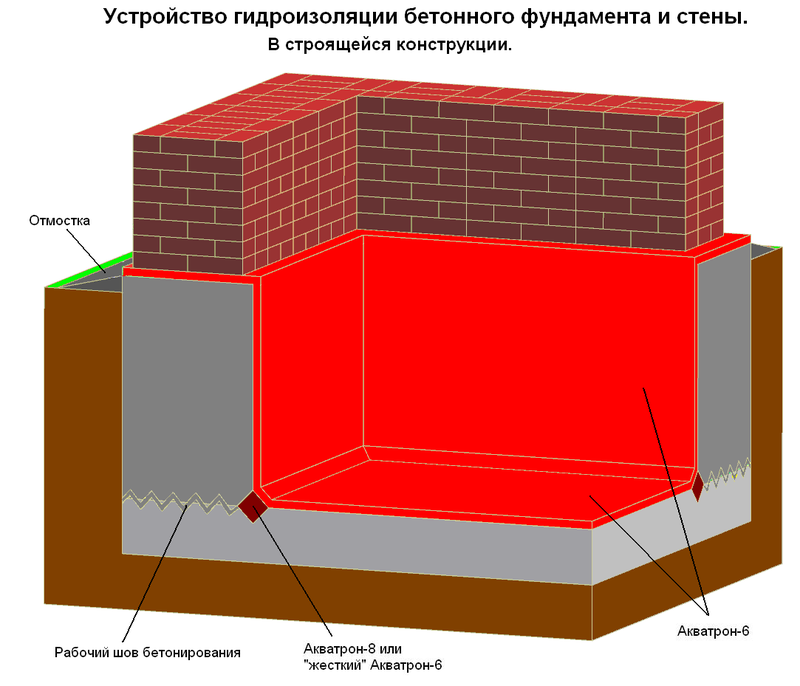 About 1.5 to 2 kg/m² will be consumed for walls and 2 to 2.5 kg/m² for the foundation. It is better to apply the waterproofing mixture up to the ceiling or as a minimum above the ground level. After applying the basement waterproofing materials from within, the surfaces should be moistened again and protected from impinging direct ultraviolet radiation for three days. Remember that the best result is achieved only if the waterproofing mixtures are applied strictly according to the instructions presented on the packaging. The Aquatron series of products has received all required certificates and is recommended for use in structures and constructions of all types. Because of the absence of components harmful to human health in the compound, the materials can be applied in reservoirs and water facilities intended for storage of potable water. Intheeventofany questions associated with using the Aquatron compounds for waterproofing basements, ask the specialists of our company. We will advise you about the correct and effective application of the mixtures for waterproofing and for protecting installations against water and moisture.